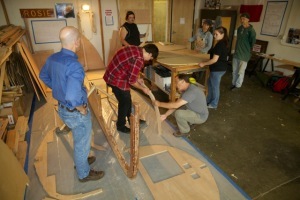 Seven to ten students will spend their summer polishing math skills and learning teamwork by building a 16-foot sailboat, the brainchild of CFM Partner Norm Eder and his wife, Sherry, who are advocates of hands-on learning.For most of us, boats are a source of recreation and relaxation. For seven to 10 local youngsters, building a 16-foot sailboat will be an opportunity to polish their math and work skills this summer. CFM Partner Norm Eder and his wife, Sherry, were the spark plugs behind a partnership between Worksystems, Inc. and the Wind & Oar Boat School to create a hands-on learning opportunity for at-risk youth. The young boat builders got to work this week after learning about shop safety, materials and tools. They were assigned to read the plans for the boat, which was designed by famous French naval architect Francois Vivier. It will take them 10 weeks from laying the keel to the final paint job, all under the watchful eyes of two master boat builders. Eder, who worked at the Oregon Graduate Institute before joining CFM, has been a long-time advocate for hands-on learning and played a role in OGI's start-up of Saturday Academy. One of his current clients is the Manufacturing 21 Coalition, which has engaged in numerous efforts to link industry, university research and skilled worker training. Sherry has been a classroom teacher for 20 years and now guides an early childhood Head Start program for Neighborhood House in SW Portland. The idea for the innovative summer program came last fall after Eder joined the Wind & Oar Boat School board. He lined up the partnership with the workforce board that covers Multnomah and Washington counties, which supplied the youngsters, and the nonprofit school, which will provide instructional training. Worksystems Inc. is funding the educational costs, as well as providing stipends for the student boat smiths. The youngsters will work 3.5 hours per day, five days a week. In addition to polishing their math skills (nothing on a boat is built without mathematical calculation), program participants will learn the importance of teamwork, time management and construction planning. They also will learn different methods of traditional small craft construction and how small craft design and construction technologies evolved to meet the practical needs of those who venture onto rivers and oceans. "I've built my own wooden boat that I sail and it gave me great satisfaction," Eder says. "It just seemed to me this could provide equal or greater value to students over a summer." One of the first challenges the students faced was converting metric measurements to more familiar values as they began attaching the first bulkheads to the keel. They also will learn about sustainable practices, durable woods and sail-making.